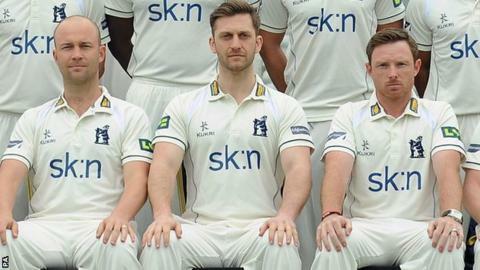 Warwickshire are still to announce a decision over who will captain the county during Jim Troughton's absence over the first month of the season. Troughton will be out for the first month of the new county season with a recurrence of the same back injury that caused him to miss much of last term. Opener Varun Chopra stood in as skipper for the 35-year-old last season. "We'll announce that as and when the time is appropriate," Bears director of cricket Dougie Brown said. The Bears also now have England batsmen Ian Bell and Jonathan Trott available. "I'd love to do it," said Bell. "Any time in the past when Jim has been injured or they have needed me to captain, I have loved doing that. "Obviously I want to be playing for England for a fair bit more time yet but one of my goals is to be able to retire from England and come back to Warwickshire. If I was lucky enough to be captain at the end of my career that's a goal I'd love to achieve." Bell and all-rounder Chris Woakes are expected to play in Warwickshire's first four Championship matches, starting with the opener against Sussex at Edgbaston on 13 April. Trott, back after a break from cricket, is available for selection by Warwickshire for the foreseeable future, unless he can find the early season form he needs to win back the place in the England team that he himself discarded in Brisbane back in November. But for now, Brown is looking no further than the three-day game with Oxford MCCU in The Parks starting 7 April. "Varun Chopra's going to captain against Oxford University," he told BBC Coventry & Warwickshire. "And clearly we've got a wealth of experience in our England players that are coming back to the fold. "For the time being we're just going to get on with our cricket." As for Troughton himself, he admits that he is having to be careful not to rush his recovery from back surgery, having returned to light training. "Because I'm not in pain like I was before I think I can do everything everyone else does," he told BBC Coventry & Warwickshire. "But the healing process is the key to this. "If we get anything wrong it could create more scar tissue and it could take me back to square one so the physio is having to hold me back a fair bit. "I've got to be realistic about how I do get back to playing again but hopefully that happens very soon."